A police officer died when his car hit a tree as he returned from a night shift, an inquest heard. 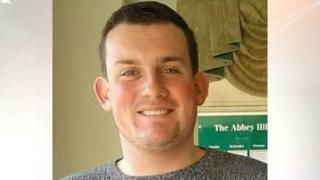 PC Daniel Clayton-Drabble, 24, crashed his BMW near Whittlebury, Northamptonshire, early on Boxing Day. Northampton Coroner's Court heard that a lack of sleep for the Thames Valley Police officer may have been a factor. However, no blame was apportioned to PC Clayton-Drabble's shift pattern. The family of the recently-engaged officer said he had "a desire to help others". The alarm was raised by a witness who drove past the scene on a country lane at about 07:30 GMT. They initially drove past thinking the BMW was parked but turned back when they realised it did not have lights on and because it was dark. On closer inspection, they said the BMW was on the other side of a ditch, with the front end having hit a tree, and that the engine "was not ticking". The inquest heard that road and weather conditions were unlikely to have caused the crash and concluded it was likely the victim fell asleep at the wheel. Susan Clayton-Drabble said her son was a comedy and sport lover and, aside from supporting Liverpool and Leicester Tigers, enjoyed Formula 1 and golf. "His smile will live in our hearts forever," she said. Northamptonshire coroner Anne Pember recorded a verdict of accidental death.